This exciting new Antarctic expedition provides a modern twist on a much-loved classic. Utilizing our decades of experience exploring Antarctica, we have designed a new voyage allowing us to reach our objective of the Antarctic Circle in just 11 days. On the way south, we enjoy eight days of off-ship exploration along the Antarctic Peninsula, visiting a large number of landing sites and cruising among the ice floes in our Zodiac boats. We use our time efficiently, by embarking in the port of Stanley – the quaint capital of the Falkland Islands. Crossing south to Antarctica we witness the magnificent pelagic seabirds of the southern region, including the giant Wandering albatross. This ocean habitat teems with life above and below the water and is a fascinating ecosystem in its own right. We navigate the ship south, hoping to reach the Antarctic Circle in the vicinity of Detaille Island. Returning to the north, we aim to visit several classic locations such as Petermann Island, and the iceberg ‘graveyard’ at Pleneau Island. We transit the Lemaire Channel if ice conditions permit and make continental landings at Paradise Harbour or nearby Neko Harbour. Both locations offer outstanding hiking opportunities. Each day we explore on shore by foot, observing wildlife colonies, visiting historic huts and science bases, photographing icebergs and soaking up the incredible landscapes that surround us. The adventure is not over and we complete our voyage with visits to several locations in the South Shetland Islands, including Deception Island. 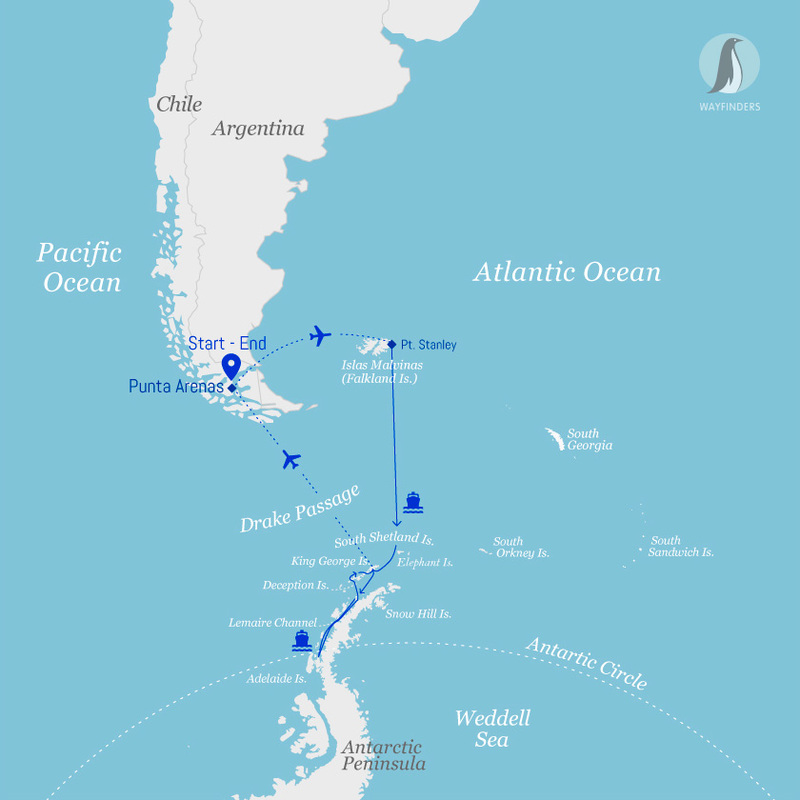 We disembark the ship at King George Island and fly back to South America in just two hours – saving more than two days crossing the open waters of the Drake Passage. For a relatively short voyage, this trip packs a serious punch and offers fantastic scenery, wildlife, historic and scientific interest. Our journey commences this morning in the southern Chilean city of Punta Arenas. We meet at a central location before transferring to the airport for our scheduled flight to Stanley in the Falkland Islands. (This flight is included in the price of your voyage). After a short 90-minute journey we are met on arrival and transferred to the pier. Stanley is currently home to just over 2,000 residents and is reminiscent of a rural town in coastal Britain. It is charming with brightly coloured houses, pretty flower-filled gardens, a quaint cathedral and several local pubs. The waterfront memorial, built to commemorate the lives of the servicemen lost during the Falklands War in the early 1980’s, is a sobering reminder of recent history. There is time to explore the town, before we make our way to the ship for embarkation. After settling in to our cabins and exploring the ship, we meet our expedition team and fellow passengers. Excitement is in the air as we enjoy a welcome cocktail, dinner and cast off, bound for Antarctica – and the adventure of a lifetime. We chart a southerly course for Antarctica. This stretch of the South Atlantic is rich in its bio-diversity and showcases an abundance of wildlife. We will be joined by hundreds of seabirds including the wandering albatross. Giant petrels and smaller Cape petrels are also constant companions as make our way south. Photographing these magnificent birds from the deck of the ship takes patience and skill and our photography expert will be on hand to show you the best techniques. Join the ship’s Captain on the bridge and learn about the operations of our modern research vessel. Throughout the day our onboard experts educate us with a series of presentations about the environment, the wildlife and history and the locations we hope to visit in the coming days. If we enjoy good sailing conditions crossing to Antarctica, we may include a visit to the very historic location of Elephant Island – a place central to the Shackleton story. It is from here that Shackleton and four of his companions set off on their epic ocean crossing to South Georgia 100 years ago. Shore landings at Point Wild are notoriously tricky due to surging swell onto the rocky beach. Nevertheless, this a thrilling place to visit. This morning we are in position at King George Island – the largest in the South Shetlands group. There are two landing sites here and a visit depends on the prevailing weather conditions. Penguin Island and nearby Turret Point offer good opportunities for shore landings to view Adelie, chinstrap and gentoo penguins. Southern giant petrels, kelp gulls and Antarctic terns are also known to nest here. This afternoon we continue our journey south, navigating into the broad expanse of the Bransfield Straight – making our way ever closer to the Antarctic coastline. This is an important migration corridor for wildlife and we keep a lookout for whales in the waters surrounding the ship. Large icebergs will be present from this point onwards and make for striking photographs in the evening light. By morning, the towering mountain peaks of the Antarctic continent loom into view and we should make landfall around Wilhelmina Bay. This is truly an ‘A-list’ location and a place we often encounter sizeable pods of humpback whales. We navigate under the towering cliffs of Spigot Peak and into the Errera Channel hoping for a shore landing at Cuverville Island – home to a rookery of Gentoo penguins. It’s a fantastic location for a Zodiac cruise or a paddle in the sea kayaks. We encourage you to spend time on the outer decks soaking up the scenery as we navigate south. We pass through the ice strewn waters making our way towards out ultimate objective, the Antarctic Circle. Given favourable ice conditions, our first goal will be to sail south of the Antarctic Circle and into Crystal Sound. A favoured landing site here is Detaille Island, home to an abandoned British science hut from the 1950’s. This vicinity marks our turnaround point and from now on, we return in a northerly direction exploring the dramatic coastline of the Antarctic Peninsula. We hope to visit a working scientific base to learn something of the important climate-related research happening here. A hike over the snowy saddle of nearby Winter Island allows us to stretch our legs and explore a historic British Antarctic Survey hut. If the conditions are right, we aim to offer our overnight camping program to all adventurers somewhere in this vicinity. We have all the gear onboard and an experienced team to make this a night to remember! the nearby Lemaire Channel. Pleneau Island offers more opportunities for shore landings. Just off shore, massive icebergs run a round in the shallows. Constant wind and wave action sculpt these gargantuan chunks of ice into fantastic shapes, revealing more shades of blue than you can possibly imagine. For many, a Zodiac cruise here may well be a highlight of the voyage. By morning we arrive in the South Shetland Islands. The adventure is not over and if the weather conditions allow, we sail the ship into the flooded volcanic caldera at Deception Island. This is a very dramatic place and history is all around us as we explore the old whaling station, with the rusted old boilers and dilapidated wooden huts. At the far end of the beach is an old aircraft hangar. This is where Australian, Sir Hubert Wilkins made the very first flight in Antarctica in 1928. There is also an outstanding hike here, high up onto the rim of the crater. On a sunny day, cruising along the coast of Livingston Island is a memorable experience. 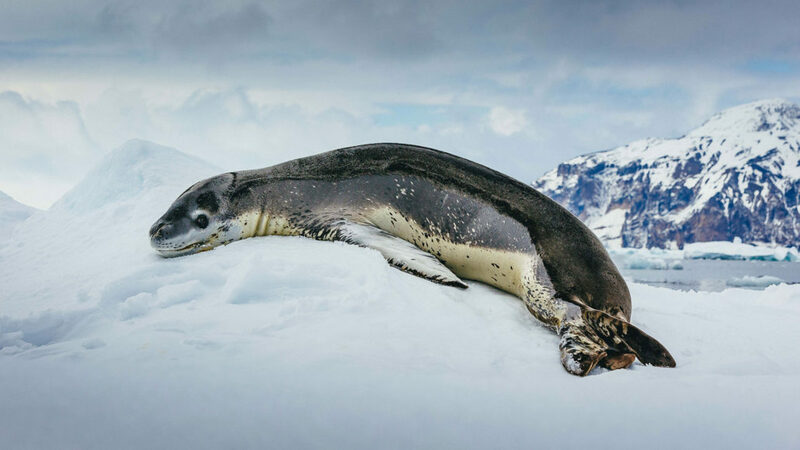 There are several other landing sites in the vicinity including Half Moon Island, or the broad pebbly beach at Yankee Harbour, where we sometimes encounter Weddell seals sunning themselves. This is another great spot for a hike or a Zodiac cruise. It’s a fitting place to reflect on a wonderful expedition. Charting a course for King George Island in early evening light, we enjoy a special dinner attended by the Captain of the ship. This morning we are anchored off King George Island. We say goodbye to our crew and transfer ashore by Zodiac and time permitting, we will explore the surrounding area. There are several important science bases here including Chile’s Frei Station and Bellingshausen Station. We are transferred to the airstrip for the two-hour flight to Punta Arenas in southern Chile (this flight is included in the price of your voyage). We recommend you spend a night in Punta Arenas in the event of any delays returning from Antarctica today. On arrival, a transfer is provided to several hotel locations downtown. Punta Arenas is an interesting city – and also the gateway to the magnificent region of Patagonia. New for 2017/18 – We include a complimentary hotel night in Punta Arenas at the end of the voyage for all guests returning from King George Island. This evening is at your leisure. Punta Arenas is home to some cozy restaurants, cafes and bars – including the historic ‘Shackleton Bar’ at the Hotel Jose Nogueira – a fitting location to reflect on your journey to Antarctica. After a leisurely breakfast and check-out, make your own way to the airport for your onward journey. (We recommend you book flights after midday). Otherwise, why not continue your exploration of Patagonia. Just a few hours north, lies the celebrated Torres del Paine National Park – home to towering peaks, glaciers and spectacular wilderness – a paradise for hikers and nature lovers.